What a year for Tourism in Kerala! 2013 has been one of the the strongest year for Tourism in Kerala and there were problems in the middle of the year like floods in Munnar and hartals and strikes. The good news is that Tourism is up, but what types of tours in Kerala did people take? Are you planning a vacation to Kerala and want to know what options you have? Well you’re in luck! Here at Iris Holidays we have gathered our data and would like to present you with the 2013 top 5 popular tours from our set of Kerala Holiday Packages. Our most popular type of tours in Kerala and our specialty are Customized Kerala Honeymoon Tours and among these type of Tours Green Valley Package was the most popular tour! This tour covers the best of Kerala including the popular hill stations of Munnar , Thekkady along with a Kerala Houseboat package with last day sightseeing in Kochi and provides any honeymoon couple a chance to enjoy hill station in Munnar, boating and (a little bit of) adventure in Thekkady along with backwater experience in Alleppey or Kovalam with last day sightseeing in Kochi where you can enjoy history and culture. We had customised this tour for 39% of our guests and there were guests who stayed at high end resort as well as budget resorts enjoying their honeymoon as well as the holiday. Green Valley Tour Package was most popular among the foreign guests. “In Short the best honeymoon package you can get in Kerala “. 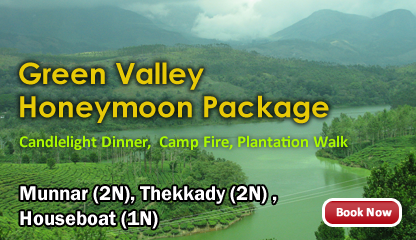 That is how we describe Dream Kerala Honeymoon Package with Treehouse Stay. This is a 6 Day honeymoon package where you can spend 1 night in a beach, 2 nights in a Treehouse perched on the top of the hillsttion, 1 night in a resort near the waterfalls, 1 night in houseboat and finish this off with last day sightseeing in Kochi. We reworked on the destinations and the resorts in this package this year based on the guest feedback and has added a new beach resort to reduce the travel time so that the honeymoon couple can get more time toe enjoy between themselves rather than spending whole time in the vehicle. If you are planning to come to Kerala for a honeymoon then you need not look further and request from us a quote for this carefully crafted honeymoon package. Best of Kerala Tour Package was popular among the weekend guests who called us from Bangalore, Hyderabad and Chennai. This is a 4 Day tour package where you can spend 2 nights in Munnar and 1 night in a Houseboat in Alleppey or Kumarakom and provides you with experience of hill station and the houseboat. This is an ideal package for anyone who is looking forward to spend a 3 day long weekend and is most popular with our Indian guests. WOW Kerala package is for guests who prefer beaches instead of wildlife sanctuaries and you have an option of choosing Kovalam if you don’t want to visit Thekkady. WOW Kerala Tour Package covers Hill stations in Munnar, Backwaters in Kumarakom and Beaches in Kovalam. An ideal holiday for anyone looking for a variety of experiences while touring Kerala. This tour is popular with foreigners and Indian guests who have taken the services of Iris Holidays. Every family is different and we understand that. We realize that some people want total freedom, while some people prefer a full tour to have everything possible planned out for them, but there are also travelers stuck somewhere in the middle. Family P L A Y C A T I O N S provide the freedom and some flexibility to take the day as it comes. If that describes you then we have what you’re looking for- one of the latest collection of tours that we added this year. Whether you have an honeymoon itinerary in mind or no clue where to start we’re here to help. Let us know what you may have in mind and along with one of our skilled personal travel specialist you’ll create the honeymoon tour of your choice that suits your dream budget. Did we mention that from this year, if you are a foreign guest then our tour packages include a complimentary mobile phone with Indian number to provide you with added security and peace of mind .